With the pollution level rising in Delhi day by day, the citizens of the national capital are doing their best to do their bit in controlling it. After initiatives such as the odd-even rule, car-free days, and use of public transportation, a group of innovative people came up with the idea of Pillion Rides, an affordable e-bikes taxi service. Targeting single office goers, students, and the general public, the e-bike taxi operates in central Delhi, at an affordable price of Rs 20 for the first km and then Rs 5 for every upcoming km. Launched in the year 2016 as Promto, now known as Pillion Rides is the brainchild of Karan Chadha, Pawneesh Rampal and Nikhil Malik. 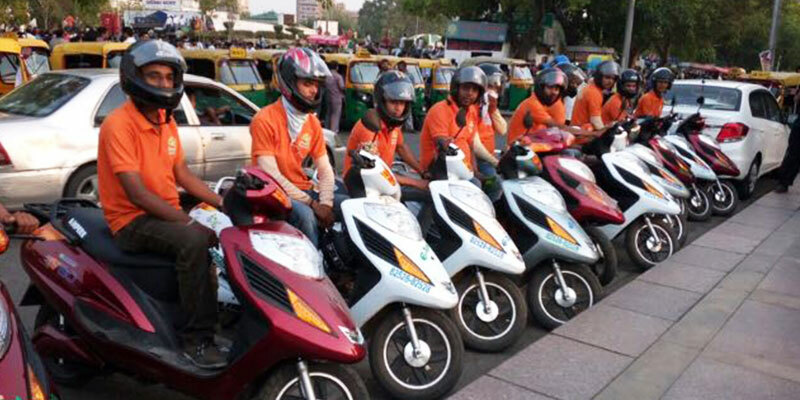 Pillion Rides focusses on providing last mile connectivity and is available from bus stops, and metro stations within a five km radius. Presently they own 60 bikes, which operate from Karol Bagh, Jhandewalans area, and Chandini Chowk. The startup is also contributing to the Skill India Movement, by creating job opportunities for the riders. The riders go through a series of rigorous training, background check, and police verification to ensure the riders safety. They also have both male, and female riders. Going ahead, the brand plans to expand it’s reach in Delhi, starting with Delhi University’s North Campus colleges. They also plan to increase their fleet to 100 and are eying two other cities. These affordable rides are not only good for your pocket but are also good for the environment. Fairy Lights, Open Balcony, Paneer Mozarella Sandwich, This Cafe Is For The Budget Eater! How About Having An Entire Meal Just Under INR 100? Yasss! !